Our bedding is over stuffed with high memory engineered memory fiber fill that provides extreme support for any large breed senior dog. 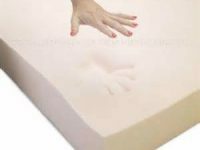 The structure of an optional orthopedic foam insert is designed to fully support the skeletal system, while still being soft and comfortable, and it also springs back into place after every use. 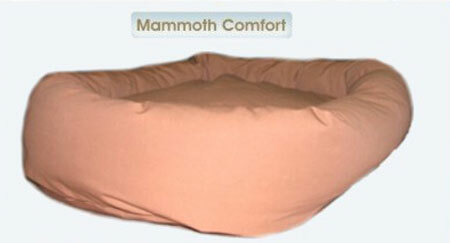 The materials used in Mammoth beds are the absolute best material to ensure a good night’s rest for your senior dog. It’s great for other common health issues in largest dogs, such as easing hip pain, easing back pain and easing joint pain. Some beds offer couch style designs that are open on one side and raised off the ground on the other, providing easier access for the dog. 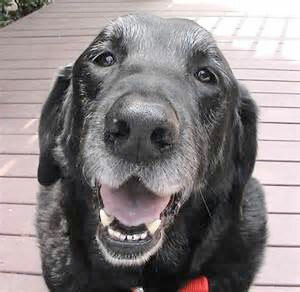 Just like older people, minimal movement is best for a senior dog. You don’t want them to struggle while entering their domain. Donut beds are great for creating a domain that surrounds your pet. For older large-breed dogs with arthritis issues, Mammoth can provide excellent support for easing joint pain and those suffering from hip dyslpasia. Some beds are preferable for pets that like to stretch out when resting. If your dog likes to be outside often, consider our outdoor, water-resistant beds. The finest fabrics for the outer shell of the bed, including canvas, denims, microvelvets, fleece, vinyl, leatherettes, funfur and sherpa. A variety of bedding colors, including lush patterns. A personalized bed with up to 21-characters of embroidery. A variety of sizes, from 20 to 72 inches, that guarantees we carry a bed fit for your big, furry friend. Our beds are specifically designed to meet the needs of largest dog breeds like Irish Setters, Boxers, Great Danes, Belgian Sheepdogs, Poodles, Boxers, Dalmatians, Golden Retrievers, and Saint Bernards. Our beds are one-hundred percent washable with a convenient removable pillow. This will provide a more sanitary experience for your older pet, and keep your house smelling fresh. Plus our beds are easy to travel with. They’re perfect for camping, hiking, or other nature adventures, giving your dog will have a little piece of their home turf no matter where you are. And of course, you can be sure that you will receive the best in workmanship and materials. The industrial strength materials used in every Mammoth can stand up to the largest of dogs. 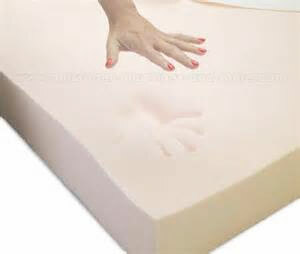 The engineered high memory fiber or orthopedic foam creates maximum comfort for life. It’s a secure domain that your dog can call his or her own. Plus it’s an insulated bedding atmosphere for older dogs that have trouble retaining a high body temperature. While your dog may be sleeping on your bed or on the living room couch, having a Mammoth will save you trouble and help your pet be comfortable in the puppy to senior years. Investing in a fashionable, luxury bed like a Mammoth isn’t as expensive as you would think. And right now if you order two beds, you’ll get $10 off plus free shipping. Just as our bones and muscles get sore as we age, so do our canine friends. 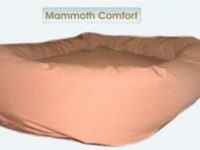 So, give them the comfort they desire in their later years with a Mammoth bed. You and your best friend will be glad you did.